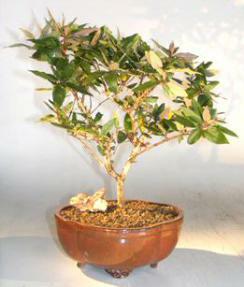 The Japanese Honeysuckle is a climbing vine that we have trained into bonsai tree form. 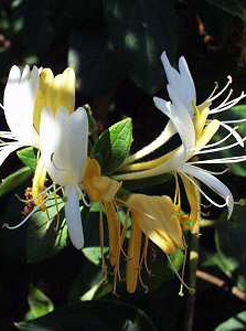 It blooms in the spring and summer with fragrant creamy white flowers. It benefits from pruning and thinning. The top of the leaf is green and the color on the bottom of the leaf is purple. The cultivar name honors George Rogers Hall (1820-1899), an American medical doctor living in Japan who founded a garden in Yokohama.